A touch of summer. Radish salad with goat cheese and black salt. I know! It’s autumn out there.. and most of you would like to see hearty, meaty dishes with lots of roasted vegetables.. When I think “autumn and hearty” I always imagine stew and potatoes! Or that’s because I love potatoes! 😀 You know, in Russian potato is ‘kartoshka’, and we consume it a lot. But today’s hero is a fresh salad! The temperature in Dubai slowly but steady going down.. 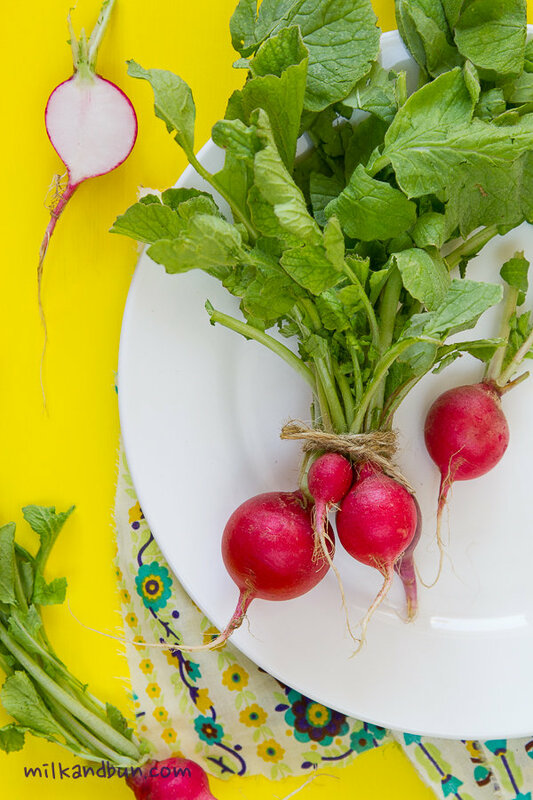 I was pretending again that it’s kinda autumn while did my shopping, and was looking for pumpkin and beets, when stumble upon beautiful radishes! They literally told me – buy us, eat us! 😀 Certainly, I had to buy them! I love simple salads, when you can cut cucumbers and radishes, dress it with sour cream or olive oil, season with sea salt, and that’s it! 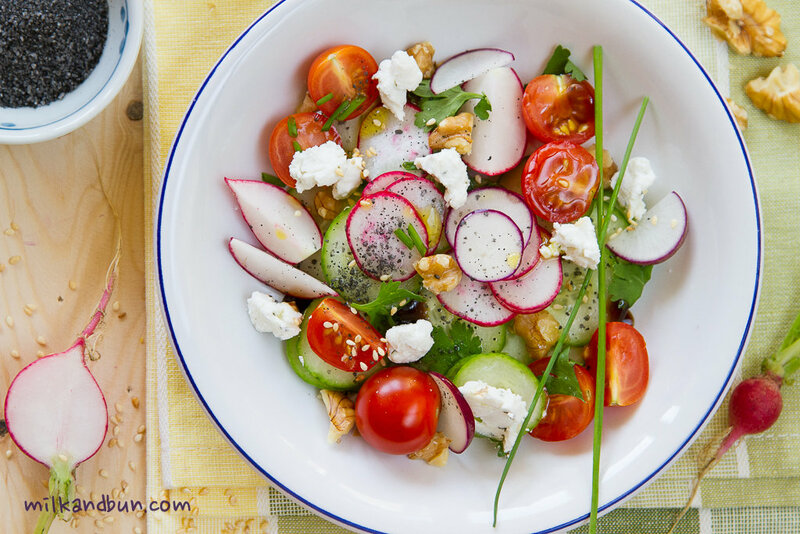 This salad is one of such variations, but with a small twist – pungent goat cheese, fancy black salt and crunchy sesame seeds! Oh, they work super here! The salad looks so bright and cheerful, that I bet you want it right now! 😉 I hope you can get fresh radishes and make it.. Otherwise, welcome to the UAE, the country of eternal sun! Thinly slice radishes and cucumbers. Cut tomatoes into haves. Put all vegetables in a serving bowl, add all remaining ingredients. Oct30October 30, 2014 • By milkandbun • This entry was posted in Healthy choice, Salads, Vegetables and tagged beautiful, black salt, cooking, Dubai, easy recipe, food, food blogger, food photo, food photography, food styling, healthy, My Life, photo, photography, photos, radish, radish salad, raw vegetables, recipe, Russian, Russian recipe, salad, summer, UAE, vegetables, vegetarian. Bookmark the permalink. What a gorgeous salad. I don’t usually like radishes, but I’ve learned to pickle them and those I like. I agree with you about the goat cheese and sesame seeds. Also, a little secret, even though I’ve been making heartier dishes, I’ve also been making salads with apples and coriander leaves and oranges. It’s just such a luxury. Enjoy! I remember your pickles, Amanda! You are good in it! 😉 Love apple salads too, sounds terrific, you should make a post about it! 😀 What’s the weather in NY now? I’ll take a dash of summer anytime. This looks light and refreshing. I can have stew and potatoes any ol time. What about combo of roasted potatoes and fresh salad? 😀 Hearty, healthy and fresh in one! Lovely salad. Though, I’m in meat mood right now. It’s a beautiful salad, it just screams summer, fresh and colorful. I love it and it would go so nicely with those autumnal stews, to cut the richness with a bit of light and fresh. Absolutely agree,Susanne! It’s great that now you can buy fresh veggies throughout the year! What a wonderful fresh looking dish! I’ve been stuck eating squash and chili the past few days and this sounds so appetizing. Especially the goat cheese… yummy!! Actually, I’ve been eating a lot of pumpkin too! Though, its not even cold here! 😀 Thank you for the warm comment, Heather! I never say no to everything that reminds me the sweet summer! Thank you, Katerina! Is it cold in Athens now? Or you have a nice weather most of the time, like here? Especially if you like radishes! 🙂 Thanks for commenting! I think this is definitely a year round salad! Especially nice to have something fresh, crispy and colorful on the table next to the meats and potatoes! 🙂 It’s beautiful. And fresh and crunchy! Thank you, Liz! 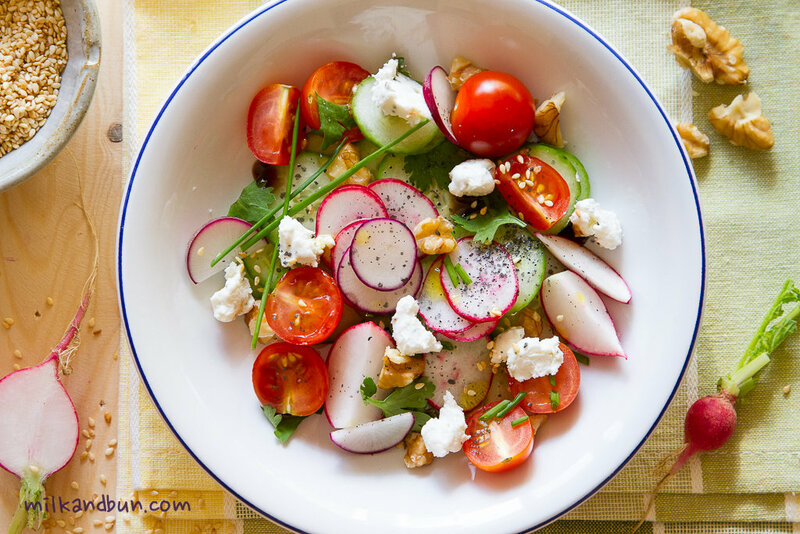 Mila it looks gorgeous and super fresh – perfect salad to take with you to work for lunch break! For super-light lunch! 😉 Thank you, Raphaelle! Simple but not boring, right? 🙂 Thanks for stopped by my blog!